Poppy tells of Kenya visit. 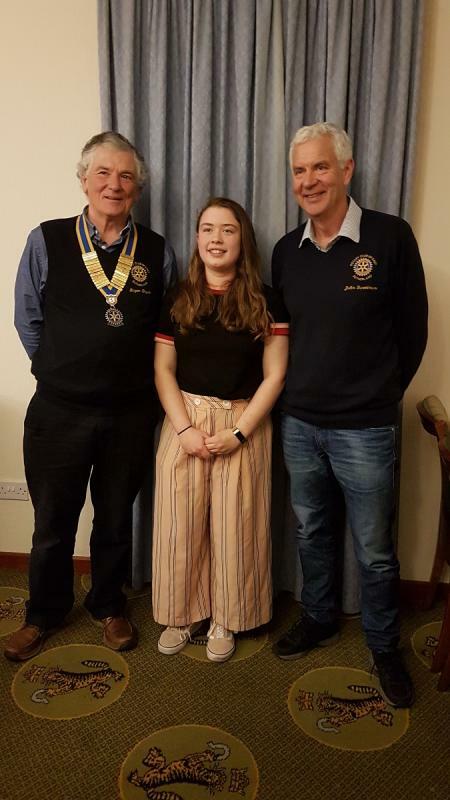 Brora girl and Dornoch Academy pupil Poppy Watson was the guest speaker at the Rotary club on Wed 13 March 2019 and wowed the audience with her drive and her enthusiasm for helping others. Poppy is well known to the club as a Scout who we helped deliver an earlier project and to go to Canada to attend the World Jamboree. She has entertained as a singer and dancer and with her own band at the Dunrobin Garden Party and at Burns Suppers and other concert events in Golspie and Brora and yet she is only 14 years of age. Her talk was intended to be about a fantastic effort of humanitarian aid that saw her spend last summer in Kenya (more of that to come!) but before she spoke on that she explained her local voluntary and sporting background - volunteer coach and player with Brora Rangers Ladies and Youth teams, Volunteer helper at the Hub in Brora, Volunteer helper with the local food bank. Since the age of 6 Poppy has been a part of the Scout movement. Her schooling in Brora and Rotakids involvement saw her involved with the club tern project and with Mary’s Meals and so much more, volunteering and helping others is a way of life for Poppy. Her recent visit to Guando, Kenya proved to be an inspiration for her, she described and illustrated with the skill and the panache of someone twice her age, the hardships within the slum community of Kirera, and its contrast with the adjacent urban affluence. She told of how schools have only a small room which in Scotland would hold 10 or perhaps 15 pupils but in Kenya serve 60 plus as a classroom. How teachers have to break pencils in two or perhaps 4 so that the kids can write in the exams they need to pass to get a proper education at 13 or be thrown out of the system! She told of the dignity of the impoverished people and their striving for a better education and a better life. Her experience ranged from being an assistant teacher to helping the elderly in Kenya to combat language challenges across their communities. Her positive and active support has so impressed the Amuka Foundation that although technically she is too young, they have appointed her as a Trustee of their organisation!!! And finally a wonderful added connection between this Rotary Club and Kenya and Poppies work there:- The East Sutherland Rotary Club has sponsored new strips for the Brora Rangers Ladies team and this allowed Poppy to take all the previous kit from Brora Rangers over to Kenya and donate it to the street football clubs she helped set up, so if in Kenya you see a game of Ladies or Youth football taking place and the team strip look familiar you now know why!!! Poppy's enthusiasm seems to know no bounds and at 14 she behaves like a Rotarian on speed, her commitment and her vitality are breath taking.